How to go camping like a pro. It seems that most vacations result in some form of conflict, and when you are looking for the most relaxing vacation experience, the one true solution is to go by yourself. But if you’re a novice when it comes to the experience of exploring the world by your lonesome, you need to consider camping. Camping is a very personal experience. It gets you in contact with nature up close and personal. But so many people out there have no clue where to begin. With that in mind, if you never have been camping before, or you want to get the most out of getting down and dirty with the dirt, let’s help you out. What Else Do You Want To Do Besides Camping? Do you want to go hiking? Riding horses? Or heading out on your bike? Whatever you want to do, it’s worth looking at the activities around the overall camping experience. To go into nature, and experience it up close, it’s an enlightening experience, so you may as well take advantage of the other activities that can make you appreciate your surroundings more. There are numerous opportunities to experience wildlife. For example, you could sit on top of a cliff, with a sketch pad and pen, and draw. Or you could use this as an opportunity to escape the Rat Race, and enjoy the silence. Many meditation retreats are all about getting away from the stresses of everyday life and experiencing the world in its purest form. Either way, use camping as an entryway to the other opportunities that await you. If you want to go out there, sit cross-legged, and be at one with nature, that’s fine, but if you’re going by yourself, you will want to give some consideration to the place you’re going. It’s not always safe, depending on where you go, not just in terms of the strange things that could be lurking outside your tent at night, there are other, external problems that could sully your experience. Natural disasters seem to be increasing infinitely out in the open, and the many varieties of camp fire lawsuit relating to the wildfires in northern California back in 2017 should be, at the very least, at the back of your mind. Preparing in a mental and emotional sense appears to be more essential now than ever before. When you look back to those wide-eyed hippie ideals of the nomad who opened themselves up to nature and came back home with stories of how they have changed forever, these experiences can still happen, but they can only be achieved after a lot of planning and preparation. Research the areas you want to go to and make sure that you are emotionally prepared. While we all fancy ourselves as a great explorer, we will need some of the essentials just in case our ability to make a fire is fleeting that day. The temptation can be to head out into nature with nothing but a tent and the clothes on your back, but if you don’t have a touch of the explorer about you, then it’s important to ensure you’ve got a few hacks to keep you going. If you can’t light a fire, take some tea lights and white paper bags. These can be weighed down with rocks and you’ve got a makeshift collection of lights to brighten up a dark night. And as you will need to know where you are in the world, always take a compass. Sure, you can get a compass app on your phone, but is this going to transport you out of the everyday world and into nature? If you’re going to do it, do it right! A digital detox can be one of the most fulfilling aspects of getting out into nature. Because you are taking time away from all things technological, you will feel the benefits. And yes, while there is a temptation to take plenty of pictures and selfies while you’re high up a mountain, is this necessary? We all like to get lovely snaps of our vacation destinations, but if you are going to do it right, the very least, make sure your photo opportunities are after you’ve done your soul searching for the day. Because we can get distracted by our phones wherever we are, this takes our focus off what’s in front of us. And when you’re in a space of breathtaking beauty, you don’t want to be live tweeting it! It’s your prerogative! If you want to enrich your experience as a lone traveler, you can keep it like that. Or if you want to learn more about different cultures, you could take the tourist route, and go to the many public campsites. The great thing about going camping by yourself is that you can decide how much or how little of yourself you are willing to give to others. For those people who are on the go in their daily lives, taking an opportunity to stop, pause, and reflect can mean going somewhere people seldom venture to. On the other hand, meeting people of a similar mindset can help you get more from your experiences. Sure, the idea of camping sounds all well and good, but if you don’t like dirt, then glamping might be more your thing. There are plenty of positives when it comes to glamping. Primarily, everything is provided for you. So if you are looking to dip your toe into nature, but the idea of splashing out on numerous items of equipment that you may never use again doesn’t appeal, glamping is a more sanitary experience. There are numerous types of glamping. You can go and camp in bell tents, which is ideal if you want to go with a group of friends. The one extra comfort to these tents is that they have real beds installed. In essence, it’s more a rustic house than a tent. But, if you are looking for something a little more closer to nature, treehouses provide that childhood dream in wooden reality. They can be expensive, but if you’re looking for that authentic yet luxurious experience, this is the one! Possibly the most important part of an authentic experience up close in nature is treating nature as it deserves to be treated. You are sharing your home with wildlife, so you need to go into the campsite with an eco-friendly mindset. Be sure that you are responsible for your waste, and based on the rules of the campsites you are going to, you have to adhere to these at all times. Some things are simple and common sense, such as bringing litter bags to store your waste but also making sure that you keep your lighting to the bare minimum. It’s important that you don’t disturb wildlife. And if you want an authentic camping experience by making an open fire, you had better make sure that you’re not breaking any rules. It’s important that you treat the campsite as carefully as possible. This is why you’re best taking the bare minimum. In fact, ensuring that all you have are the essentials to stave off hunger, and keeping warm can make for an authentic experience in nature. Whether you want to learn about nature or about yourself, treat the camping experience as an opportunity to learn about the surroundings, not just in the campsite, but the wildlife that lives there, but also take the opportunity to focus on your thoughts and feelings. We don’t always take the opportunity to learn when we go somewhere, but rather embrace the chance to relax. By all means, you can take it easy, but the benefit of a great vacation is that you come away feeling recharged, not just physically, but emotionally as well. The best vacations in life give us those opportunities to develop a coping mechanism, and arguably, nature is the greatest school of all. Without sounding too much like a hippie, but you realize just how irrelevant many things are in life when you get down to the bare basics. Whatever you do, take the opportunity to learn. And with any camping experience, a little preparation goes a long way, not least in terms of the weather. Because you could go in with the best of intentions, and have the entire experience washed away, literally, by bad weather! 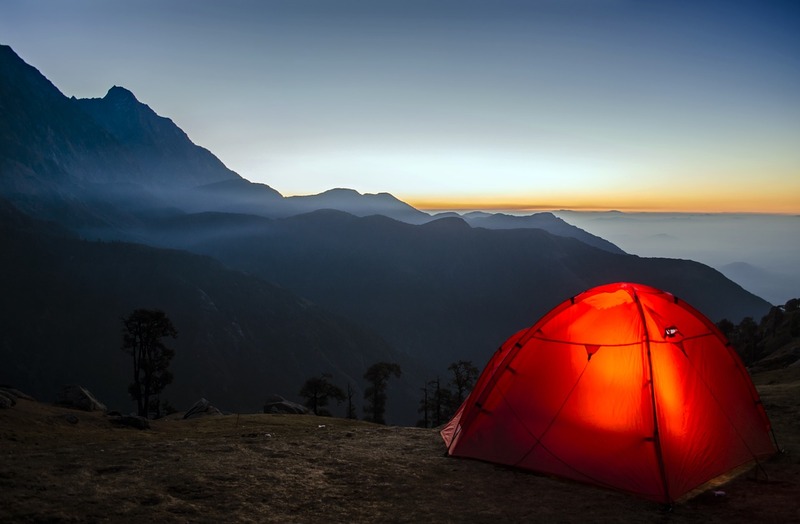 To get the most out of your camping experience, it’s best to go in with an idea of what you want to achieve but also think about the practicalities. In many ways, it can teach you a lot about yourself, how you are able to cope in nature, but as with any great traveling experience, you can learn and develop so many useful skills. It’s not just about sitting by the campfire and listening to the owls, but it’s about using the solitude and quiet to learn a little bit more about you. Previous post: Is the Bitcoin Revolution Relevant to Your Life and Travels?